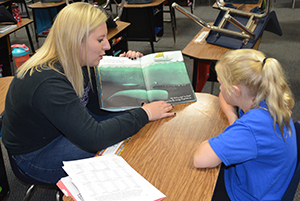 Allison Ster, an Upper Iowa University All Social Science major from Alburnett, Iowa, reads a book with Kenidee Hepker at West Central Elementary. Ster is one of a number of UIU students who help tutor reading to West Central students after school. There’s no substitution for real-world experience when it comes to training the teachers of tomorrow. Classroom instruction can only go so far for an education major that can’t be gleaned from actual time in a classroom. A number of Upper Iowa University students are getting that real-world experience through a partnership with West Central Elementary in Maynard, Iowa. Every Monday through the first quarter, 12 UIU students of Barb Ehlers, UIU associate professor of education, will head over to West Central to teach a science lesson with Diane Boltz’s third-grade class. It gives these students first-hand experience in not only creating a lesson with the Next Generation Science Standards that were introduced in 2015, but also in implementing the lesson with elementary students. Not only does this aid the UIU students, but Mrs. Boltz’s class benefits from more one-on-one instruction they receive throughout the lesson. So far, the UIU students have worked on lessons about the life cycles of plants and animals and will cover soil and water conservation next week. Boltz also plans for the students to help teach a lesson on the water cycle, among other things through the first quarter. The UIU students in Mrs. Boltz’s class aren’t the only ones benefiting from the stronger relationship between the university and school district. After school, a number of other UIU students come to WC for one-on-one reading tutoring through an initiative created by fourth-grade teacher Carla Even. Each West Central student who signed up for the extra tutoring is assigned to a UIU student, who works on different reading techniques. “The students at West Central get a higher level of reading achievement and a relationship with the Upper Iowa student, which could prompt them to think that college might be an option for them in the future,” Even closed. It’s strong partnerships like these that not only improve the achievement of the elementary students, but better prepare education majors for their future careers.